Product review: I've been really digging the iTunes player for a while. It has some cool features, including one I just discovered some how by accident today. It has totally smokin visualizations (you know the trippy animated abstract graphic stuff that reacts to the music playing). The cool feature I stumbled on it that if you have the album cover art in the song info (it's a drag and drop-in), then when you have the visualizer set to show the song info in the lower left corner, it will also show the album cover down there. Sweet. I hadn't gone to the trouble of dragging cover art into any of my song tags, and it unfortunately does not automatically import that info when you add a song to your library. But amazingly one of my songs had the cover in there, don't ask me how it got there. Maybe when I stole that tune from a peer-to-peer network somebody else had already included it in the file somehow. Seems terribly unlikely, but let's go with that, shall we? So I turn on the visualizer, and there is the little album cover in the corner of the screen, how neat. Here's where it gets righteously groovy: I like the feature, but am quite too lazy to find, drag, and drop every bloody cover image for every blinkin song in my library, so I surf around for a plug-in solution to automatically import the covers. Somebody's bound to have wanted and created this, right? Right. 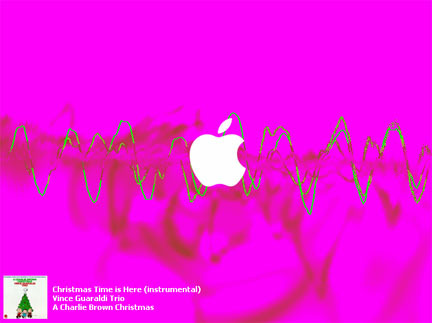 Ba da bing, iTunes art importer. Works great, and is quite totally free, my flavorite price. A few tips, it has no menu and no mouseover hints about how the hell to operate the thing, so let me help you get started. First, it runs separately from iTunes, but you choose the song or songs you want to import covers for in your iTunes program first. Weird but true. Then, with song(s) selected, you hit the button in the art import program at the top on the right that looks like a magnifying glass. Then select one of the images and hit the other button. The image should appear in your iTunes song. Check the box for auto import if you don't want to have to choose an image each time, but rather let the program pick for you. It's usually right, though GIGO applies (your sloppy song info will give you sloppy image choices). Select all your iTunes songs and check the auto box to do your whole damn library in one fell swoop. Nice. Stay tuned for a photo of the World's Largest Teapot.